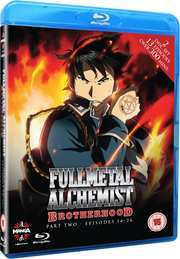 The moment has finally arrived for fans of Edward and Alphonse Elric as the brothers encounter new characters, dangers, and mysteries in Part Two of Fullmetal Alchemist: Brotherhood. The path to the Philosopher's Stone now enters unfamiliar territory, where the Elrics face exotic strangers who use alkahestry, a version of alchemy native to the distant kingdom of Xing. As insight is gained into the secret world of the Homunculi and their enigmatic creator, Lust feels the fires of Mustang's rage in battle - and the outcome of the clash will shock you. Winry endures the trial of her life when new horrors of the Ishvalan massacre are revealed. Truly, the gate is opening on a new era of Fullmetal Alchemist: Brotherhood. Are you ready to see what's on the other side?